Digital UltraViolet and Digital Copy will makes it possible for you to stream the movie Tag HD UV or iTunes Code instantly to your computer and compatible Smartphones, Andriod, iphone, iPod Touch, iPad and tablets devices anytime, anywhere. 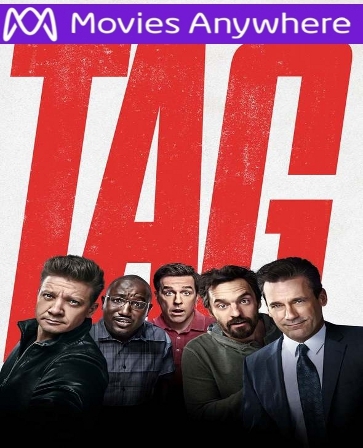 You can also download a Digital UltraViolet Copy or a Digital Copy of the movie Tag HD UV or iTunes Code to your computer and compatible devices. Liked this one. The lengths to which to the main characters go to win a game of tag get so insanely hilarious in this. Good cast too, the highlights are Ed Helms as the lead who goes to the greatest extremes to catch Renner, Isla Fisher as Helms' wife who is even more extreme than him, and Jeremy Renner as the cocky, strategic mastermind they've never caught. One nitpick: There is a romantic triangle subplot between Jon Hamm, Jake Johnson, and Rashida Jones' character that is devoid of laughs and chemistry and stops the whole film cold. Luckily, it doesn't take up much of the film's time. This also doesn't feel like a repeated viewing to me. As I said, it's funny and worth a theater price, but the jokes aren't the types that didn't leave me wanting to revisit them.